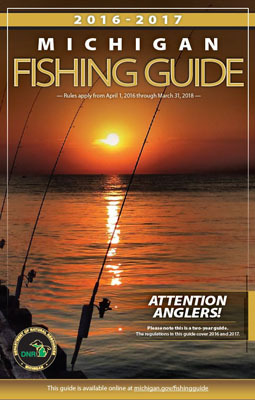 ​a list of fishing seasons, regulations, license fees & more. 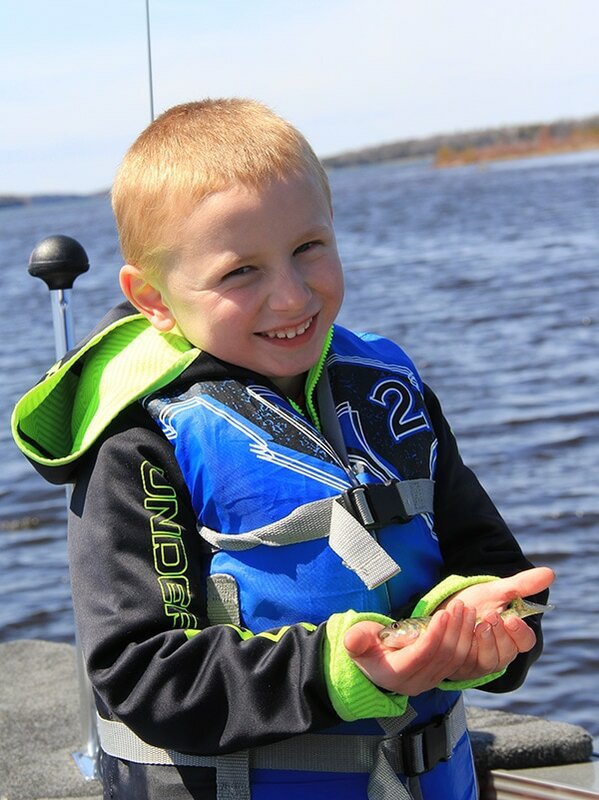 All year long, the avid angler can find fantastic fishing on Drummond Island! April 1st brings great anticipation of the smelt run. As the days grow longer and air temperatures rise and the “Ice Out” allows these little silver delicacies to enter our creeks and streams to spawn. This is primarily nighttime fishing and all ages enjoy this annual event. Laughter is commonplace, as somewhere in the glow of a lantern or flashlight a young person excitedly proclaims, “Look, I got some!” On a clear night, you will be awed by the stars that appear to be so close you can almost touch them. If you look to the north, some nights will bring a spectacular display of flickering colors known as the Aurora Borealis, more commonly called the Northern Lights. This is an experience you will not soon forget. Spring and fall brings the perch into shallow water. All sizes and age classes of perch are present, insuring years of great fishing. There is a lot of action and taking a limit is common. Some anglers time their stay to coincide with the highly desirable appearance of the black morel mushrooms that pop up when ground temperatures warm. Yellow perch fried golden brown with morel mushrooms sautéed in butter will leave you thinking that it doesn’t get much better than this! Return in the fall when perch fishing picks up again as they migrate to shallow water to feed on crayfish and minnows. Come summer, the focus turns to the opener of northern pike and walleye fishing. The Potagannissing Bay and Whitney Bay are popular areas. Trolling crawler harnesses and casting shallow crank baits are the preferred techniques for walleye. Trolling spoons and hard baits, or still fishing with big chubs and minnows under large bobbers, are better for northern pike. These methods fit the ticket for the chance to snag a trophy class fish of both species. Excellent smallmouth bass fishing opportunities exist where rocky shorelines abound. When hooked, these bronze-back beauties, as some call them, fight hard and dance across the surface of the water. This is a great sport fish and delicious table fare. Pound for pound, it is said that nothing pulls as hard as a smallmouth bass. Twenty to fifty fish per boat a day are common, using the selective harvest of catch and release, taking a few home for the table. The end of June thru July brings the aquatic mayfly hatch; ciscoes, herring and whitefish are soon to follow. These are schooling fish and groups of boats are seen tightly gathered together, staying on top of the school. The gear of choice is either the cane pole or long ultra light rod, using teardrops with wax worms or mayflies as bait. 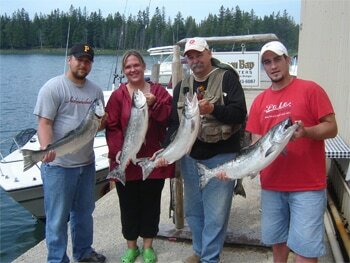 Whole families get in on the fun as the action is fast and fish are plentiful. They are easy to find; just look for the group of boats. These fish are great smoked, canned or fried fresh. 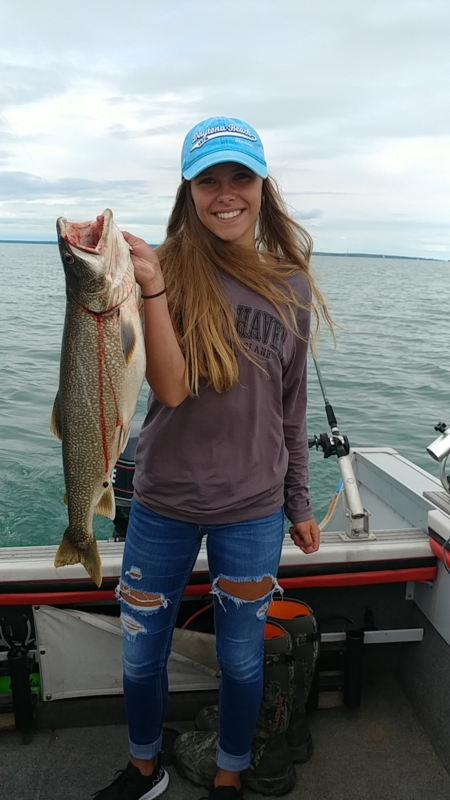 As Lake Huron offers a multi-species trout fishery, May 1st finds anglers at the mouth of the St. Mary’s river targeting lake trout and Atlantic salmon. Ivan Gable, a 25-year captain says that clients are amazed at how hard some of these salmon fight. Invariably, the same clients say, “It doesn’t get any better than this.” Mid-July brings king salmon; sizes vary by age averaging 4 to 10 lbs with some reaching up to 30 lbs. On odd years the pink salmon enter the system creating a bonanza of action and fish of 1 to 3 pounds are common. Salmon fishing remains good through late fall. ​Winter finds ice shanties dotted around Whitney Bay and Potagannissing Bay to Harbor Island. 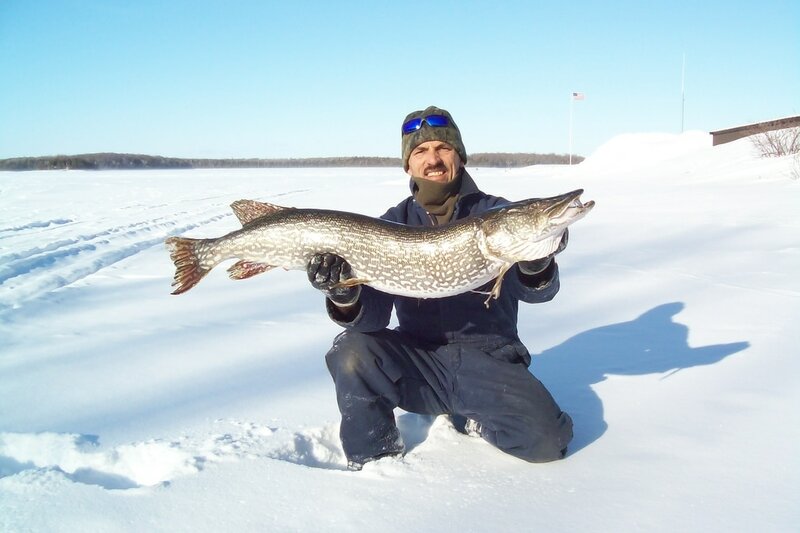 Anglers seeking northern pike use a combo tactic of spearing and tipup. Perch can be found in deep water this time of year. Snowmobiles provide transportation to and from favorite fishing areas, allowing you to enjoy this winter wonderland. 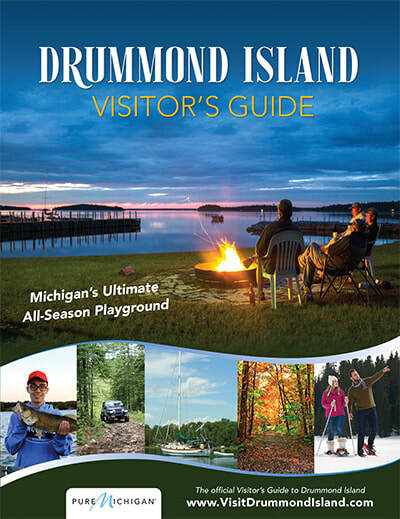 Whatever the season, the waters around Drummond Island offers fantastic year-round fishing opportunities.